The exponential growth of omnichannel shopping and ever-burgeoning demand for faster merchandise deliveries is redefining the supply chain’s distribution of consumer products goods. A seminal shift in how shoppers increasingly buy via multiple touch points — online from desktop computers, mobile devices and in-store — has created the need for the “smarter” warehouse to serve today’s connected consumer. As retailers look to merge their brick-and-mortar and online operations to cut costs and boost efficiency, warehouse management systems must keep pace. 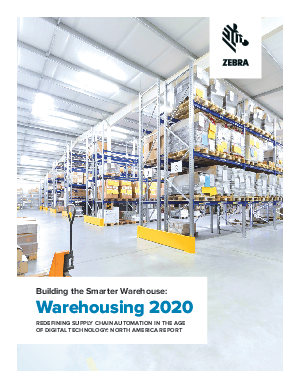 For this report, Zebra Technologies analyzed the state of the warehousing marketplace among firms in the US and Canada with at least $15 million in annual revenues. The online survey asked IT and operations personnel in the manufacturing, retail, transportation and wholesale market segments to share their insights and business plans over the next five years, in light of a rapidly changing industry.